Just 450 metres from the Sacré Coeur Basilica, Appartement Vue Imprenable of Les Studios de Paris provides self catering accommodation in the famous Montmartre district. Anvers Metro Station is 300 metres away and offers access to The Arc de Triomphe. The apartment provides a fully equipped kitchen area with an oven, electric hotplates and fridge-freezer. For your arrival a personalised food package or a fresh fruit plate can be organised for an additional supplement. 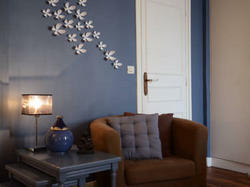 After a day?s sightseeing, guests can relax in the lounge, which features a sofa bed, TV and DVD player. Bed linen and towels are supplied upon arrival and the apartment is serviced by a lift. Additional facilities include a washing machine and ironing board. Please note that check-in takes place at Les Studios de Paris agency: 4, rue Androuet 75018 Paris. Guests will receive a complimentary glass of champagne or soft drink upon check-in. A car service is available to take you to your apartment at an extra cost. The agency Les Studios de Paris is going to email you extra information for your check in. Please inform them about your arrival time and the exact number of people. You will be charged the balance and the cleaning fees on the day of arrival. Please note that a EUR 500 damages deposit will be requested upon arrival and charged to your credit card. This may be used to charge for any damages incurred to the apartment/studio during your stay. This apartment provides: - free Wi-Fi - a kitchen and dining area with an oven, electric hotplates and fridge-freezer - a lounge area with a sofa bed - a bathroom with a shower and separate toilet An extra bed cannot be accommodated in this apartment.